HOOQ is on the search for the top film talents in Southeast Asia to turn their ideas into reality. Calling all commercial directors, producers, script writers and filmmakers. 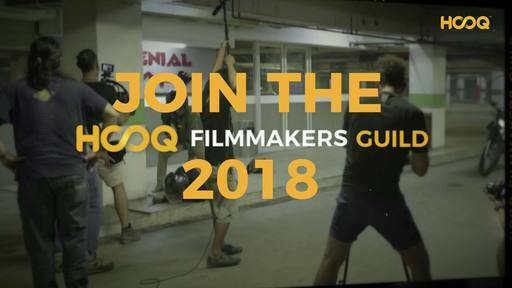 The HOOQ Filmmakers Guild is a ground-breaking, unique initiative that gives a voice to Asia’s upcoming filmmakers and writers. HOOQ Filmmakers Guild seek to bring Asia’s edgiest and most compelling stories to an audience hungry for good quality Asian TV. Each year, HOOQ will select five ideas to be made into pilot episodes. One of those pilots will then be commissioned into a full series as a HOOQ ORIGINAL. This is the second season returning to seek out film talents across Asia! HOOQ is Asia’s largest video-on-demand service, established as a the joint venture by Singtel, Sony Pictures Television and Warner Bros. HOOQ is available in Singapore, Thailand, India, Indonesia and the Philippines delivering over 10,000 Hollywood, regional and local movies and TV shows to customers anytime, anywhere by enabling them to stream and download on their Internet device or platform of choice. The HOOQ Filmmakers Guild represents the extension of the brand’s vision: ‘a million stories for a billion people’. We’re looking for a concept that is in sync with the medium of modern television in the digital age. Whether it’s a situational comedy, a supernatural drama, a crime procedural drama or limited series, a HOOQ ORIGINAL needs to be compelling enough that someone would stay up all night to binge watch every episode! You are not constrained with traditional TV durations hence episode can be as short as 20 minutes or up to 60 minutes long. What matters is the story and characters that lend itself towards binge-viewing and naturally, be binge-worthy. A HOOQ ORIGINAL has to be edgy and push the envelope on the conventional boundaries of Asian television. So if your concept is something that a free-to-air broadcaster would love, it’s probably too safe to be a HOOQ ORIGINAL. We’re looking for relatable, compelling stories and characters that speak to the audiences in your home country, a series that everyone would love to watch, but no one dares to make. We want to tell the stories that need to be told but haven’t found the right home yet. What we don’t want is a generic one-size-fits-all Asian series concept that is devoid of any cultural grounding. Any concept submitted has to clearly be targeted at one of the 8 countries that the Guild spans SINGAPORE, THAILAND, MALAYSIA, INDIA, PHILIPPINES, INDONESIA, VIETNAM or CAMBODIA. It would be great if it has cross-border appeal but the primary aim should be to be relevant to your home audience. Our focus is on exceptional storytelling first and foremost. Whilst your concept submission to the Guild must be in English, your pilot can have dialogue in your native language or a language mash-up as long as that is culturally authentic and true to your home country. For example, a Singaporean concept can be a mix of Hokkien and English or utilise Singlish or can be in Mandarin entirely. A Malaysian concept can be in Malay and English or utilise Manglish. A Filipino concept can be entirely in Tagalog or English mixed with Tagalog. Remember, our focus is on authenticity and relatability to your home audience. Whilst we are open to submissions in all genres, some genres do not lend themselves naturally to the television format or medium. Horror for example, is difficult to execute compellingly for television unless paired with some other medium. Supernatural stories tend to be extremely popular in Asia, which makes it difficult for such stories to be unique or stand out. Filmmakers should therefore ensure that their concepts are not a tried and tested formula but rather, represent an elevated version of a genre. We are NOT looking for feature film concepts that can be sliced up into smaller parts. If you have a feature film concept, then it has to be re-developed appropriately into a series format. Our preference is for concepts that have demonstrable longevity as a series that can carry multiple seasons rather than a limited series. Above all, filmmakers should ensure that their concept has an identifiable genre or if it is a genre mash-up, an identifiable number of genres. The 5 selected filmmakers will each receive a budget of USD $30,000 to develop and execute their pilot. This creates a very tight creative sandbox for the filmmaker and their team but is meant to invoke the spirit of guerilla filmmaking. Whilst filmmakers should give thought to whether or not their pilot concept is executable within the budget, they are encouraged to exercise inventiveness and creativity fully to see their vision through to fruition. If you are a filmmaker or writer or producer or in the film industry, living in SINGAPORE, THAILAND, MALAYSIA, INDIA, PHILIPPINES, INDONESIA, VIETNAM or CAMBODIA or a citizen of the above countries based elsewhere, you are eligible to submit a pitch to the 2018 Filmmakers Guild. The concepts will be evaluated by a panel of judges and the best five ideas will be turned into pilot episodes. The pilots will then be evaluated by the panel of judges and also placed on the HOOQ platform. The winning pilot will be determined based on the judges evaluations and subscriber viewings. The winning pilot will have their series commissioned as a HOOQ ORIGINAL. The winning pilot will have their series commissioned as a HOOQ ORIGINAL. Announcement of winning pilot. Any announcement date changes will be communicated by HOOQ. 1. Showreel - Filmmakers should submit a detailed set of verifiable credentials and a showreel with your best works. 3. Script - Your treatment must be accompanied by at least 10 pages of the script for the pilot. Filmmakers are encouraged to include in the creative treatment any other relevant information that would help the judges visualise or imagine the show with greater clarity, including but not limited to viable casting, concept visuals or a rip reel. However, these are not necessary and should only be included if you feel they will enhance your submission. The pilot script should be submitted as a separate PDF file. The pilot script should conform to American screenplay writing standards and formatting requirements as far as possible. We encourage script submissions in English as far as possible, but will accept script submissions in your native language. Submissions will only be accepted via the Genero platform. Any submissions via any other avenues will not be entertained. Filmmakers should ideally have credentials in the film industry, either as a working professional across any aspect of film production, e.g. scriptwriter, director, producer etc. All parties involved must be 18+ and a native of any of the following Asian countries: SINGAPORE, THAILAND, MALAYSIA, INDIA, PHILIPPINES, INDONESIA, VIETNAM or CAMBODIA. Foreigners may participate in their country of residence or submit according to the language of the country they are submitting under. Filmmakers are only eligible to submit one entry. Majority of your production must take place in the country of your submission. Watch each trailer for last year’s pilots on the Genero Blog. HOOQ’s decision will be final and exercised in its sole discretion. The judging panel will consists of top film talents from around Asia including award-winning directors, producers and actors. All Media: Global/Worldwide, in perpetuity, including talent and music. Any tax liability arising out of these Rules are your sole responsibility. HOOQ’s decision shall be exercised in its sole and absolute discretion. HOOQ reserves the rights to modify or cancel the Brief or its Rules, at any time, in its sole absolute discretion and without prior notice and in accordance with clause 2.7 ‘Cancelling Briefs, Direct Commissions or Re-Edits’ of Genero’s terms. In the event of a cancellation of the Brief prior to production commencing, HOOQ may at its absolute discretion elect not to award the Filmmaker Budget. In the event that your Submission is shortlisted by HOOQ and in consideration of your receipt of the funding, you agree to execute such documentations as may be required by HOOQ. By submitting the Submission, you expressly consent to the disclosure of your personal information to HOOQ for the purposes of administering this Brief. Only shortlisted entries will be owned by HOOQ. HOOQ will not be responsible for any similarities of character or storyline that subsequently appears on HOOQ. Your submission meets the Submission Guidelines and Restrictions (detailed in the brief above).